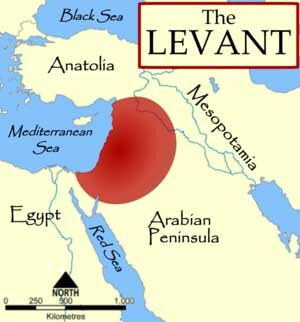 The Levant is a geographical term that refers to a large area in Southwest Asia, south of the Taurus Mountains, bounded by the Mediterranean Sea in the west, the Arabian Desert in the south, and the Zagros Mountains in the east. It stretches 400 miles north to south from the Taurus Mountains to the Sinai desert, and 70 to 100 miles east to west between the sea and the Arabian desert. The term is also sometimes used to refer to modern events or states in the region immediately bordering the eastern Mediterranean Sea: Israel, Palestinian territories, Jordan, Lebanon, and Syria. The term normally does not include Anatolia (although at times Cilicia may be included), the Caucasus Mountains, or any part of the Arabian Peninsula proper. The Sinai Peninsula is sometimes included, though it is more considered an intermediate, peripheral or marginal area forming a land bridge between the Levant and northern Egypt. Anatomically modern Homo sapiens are demonstrated at the area of Mount Carmel, during the Middle Paleolithic dating from about c. 90,000 BC. This move out of Africa seems to have been unsuccessful and by c. 60,000 BC in Israel/Syria, especially at Amud, classic Neanderthal groups seem to have profited from the worsening climate to have replaced Homo sapiens, who seem to have been confined once more to Africa. A second move out of Africa is demonstrated by the Boker Tachtit Upper Paleolithic culture, from 52-50,000 BC, with humans at Ksar Akil XXV level being modern humans. This culture bears close resemblance to the Badoshan Aurignacian culture of Iran, and the later Sebilian I Egyptian culture of c. 50,000 BC. Stephen Oppenheimer suggests that this reflects a movement of modern human (possibly Caucasian) groups back into North Africa, at this time. It would appear this sets the date by which Homo sapien Upper Paleolithic cultures begin replacing Neanderthal Levalo-Mousterian, and by c. 40,000 BC Palestine was occupied by the Levanto-Aurignacian Ahmarian culture, lasting from 39-24,000 BC. This culture was quite successful spreading as the Antelian culture (late Aurignacian), as far as Southern Anatolia, with the Atlitan culture. After the Late Glacial Maxima, a new Epipaleolithic culture appears in Southern Palestine. Extending from 18-10,500 BC, the Kebaran culture shows clear connections to the earlier Microlithic cultures using the bow and arrow, and using grinding stones to harvest wild grains, that developed from the c. 24,000-17,000 BC Halfan culture of Egypt, that came from the still earlier Aterian tradition of the Sahara. Some linguists see this as the earliest arrival of Nostratic languages in the Middle East. Kebaran culture was quite successful, and may have been ancestral to both the later Natufian culture (10,500-8500 BC), which extended throughout the whole of the Levantine region. These people pioneered the first sedentary settlements, and may have supported themselves from fishing, and from the harvest of wild grains plentiful in the region at that time. Natufian culture also demonstrates the earliest domestication of the dog, and the assistance of this animal in hunting and guarding human settlements may have contributed to the successful spread of this culture. In the northern Syrian, eastern Anatolian region of the Levant, Natufian culture at Cayonu and Mureybet developed the first fully agricultural culture with the addition of wild grains, later being supplemented with domesticated sheep and goats, which were probably domesticated first by the Zarzian culture of Northern Iraq and Iran (which like the Natufian culture may have also developed from Kebaran). By 8500-7500 BC the Pre-Pottery Neolithic A (PPNA) culture, developing out of the earlier local tradition of Natufian in Southern Palestine, dwelling in round houses, and building the first defensive site at Jericho (guarding a valuable fresh water spring). This was replaced in 7500 BC by Pre-Pottery Neolithic B (PPNB), dwelling in square houses, coming from Northern Syria and the Euphrates bend. The period of 8500-7500 BC was in Sinai, the period of another hunter-gatherer group, showing clear affinities with the cultures of Egypt (particularly the Outacha retouch technique for working stone). The Harifian culture which may have adopted the use of pottery from the Isnan culture and Helwan culture of Egypt (which lasted from 9000-4500 BC), fused with elements from the PPNB culture in the climatic crisis of 6000 BC to form what Juris Zarins calls the Syro-Arabian pastoral technocomplex, which saw the spread of the first Nomadic pastoralists in the Ancient Near East, extending southwards along the Red Sea coast and penetrating the Arabian bifacial cultures, which became progressively more Neolithic pastoral, and extending north and eastwards, to lay the foundations for the tent-dwelling Martu and Akkadian peoples of Mesopotamia. In the Amuq valley of Syria, PPNB culture seems to have survived, influencing further cultural developments further south. Nomadic elements fused with PPNB to form the Minhata Culture and Yarmukian Culture which spread southwards, beginning the development of the classic mixed farming Mediterranean culture, and from 5600 BC was associated with the Ghassulian culture of the region, the first chalcolithic culture of the Levant. 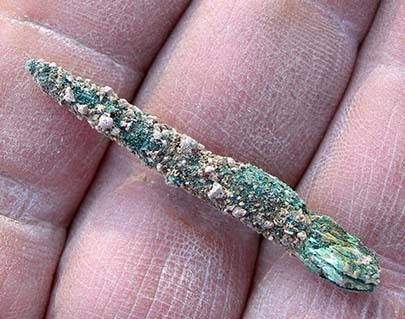 A copper awl is the oldest metal object unearthed to date in the Middle East. The discovery reveals that metals were exchanged across hundreds of miles in this region more than 6,000 years ago, centuries earlier than previously thought, researchers say. The artifact was unearthed in Tel Tsaf, an archaeological site in Israel located near the Jordan River and Israel's border with Jordan. The area was a village from about 5100 B.C. to 4600 B.C., and was first discovered in A.D. 1950, with digs taking place from the end of the 1970s up to the present day. Between 2004 and 2007, archaeologists excavated a site in Tel Tsaf in the Jordan Valley of Israel, finding evidence for a Late Byzantine-Early Islamic occupation, including a settlement that dated to 5100 B.C. to 4600 B.C. A complex found at the site included courtyard buildings, with rectilinear, rounded rooms and silos, and cooking areas. They also uncovered four burials, two of which were discovered inside two silos, and a metal awl tool that may be the oldest metal object every found in the Middle East. The first cities started developing in southern Mesopotamia during the 4th millennium BC. With these cities, ties of religion began to replace ties of kinship as the basis for society. During the Uruk phase, colonists and traders from Southern Iraq established important quarters in settlements throughout the northern part of the Levantine region (e.g. Amuq). In Southern Iraq each city had a patron god, worshipped in a massive central temple called a ziggurat, and was ruled by a priest-king (ishakku). Society became more segmented and specialized and capable of coordinated projects like irrigation and warfare. Along with cities came a number of advances in technology. By around the 31st century BC, writing, the wheel, and other such innovations had been introduced. By then, the Sumerian Peoples of south Mesopotamia were all organized into a variety of independent City-states, such as Ur and Uruk, which by around 26th century BC had begun to coalesce into larger political units. By accommodating the conquered people's gods, religion became more polytheistic and government became somewhat more secular; the title of lugal, big man, appears alongside the earlier religious titles, although his primary duty is still the worship of the state gods. This process came to its natural conclusion with the development of the first empires around the 24th century BC. A people called the Akkadians invaded the valley under Sargon I and established their supremacy over the Sumerians, and extended their control into Syria as far as the coast. The Ebla archive mentions the cities of Hazor and Jerusalem amongst other sites of the region. They were followed by the extension of Khirbet Kerak ware cultures, showing affinities with the Caucasas, and possibly linked to the later appearance of the Hurrians. This was synchronous with the empires of Ur during the 22nd and 21st centuries BC and the Old Kingdom of Babylonia during the 18th and 17th centuries BC, both of which did not extend as far as the Levant. During this time the Kingdom of Yamkhad on the Euphrates, and of Qatna on the Orontes, were important city states of the Syrian region. Parallel developments were meanwhile occurring in Egypt, which by the 32nd century BC had been unified to form the Old Kingdom of Egypt, and amongst the peoples of the Indus Valley in north-western India. All of these civilizations lie in fertile river valleys where agriculture is relatively easy once dams and irrigation are constructed to control the flood waters. This started to change around the end of the third millennium as cities started to spread to the nearby hilly country: among the Assyrians in north Mesopotamia, the Canaanites in Syria-Palestine, to the Minoans in Crete, and to the Hittites in eastern Anatolia. Around this same time various immigrants, such as the Hittites in Anatolia and Mycenaean Greeks, started appearing around the peripheries of civilization. These groups are associated with the appearance of the light two-wheeled war chariot and typically with Indo-European languages. Horses and chariots require a lot of time and upkeep, so their use was mainly confined to a small nobility. These are the "heroic" societies familiar to us from epics like the Iliad and the Ramayana. Around the 17th and 16th centuries BC most of the older centres had been overrun. Babylonia was conquered by the Kassites, and the civilization of the Indus Valley was on decline probably due to climate. Another group, the Mitanni, subjugated Assyria and for a time menaced the Hittite kingdom, but were defeated by the two around the middle of the 14th. Various Achaean kingdoms developed in Greece, most notably that of Mycenae, and by the 15th century BC were dominant over the older Minoan cities. And the Semitic Hyksos used the new technologies to occupy Egypt, but were expelled, leaving the empire of the New Kingdom to develop in their wake. In the 13th century BC all of these powers suddenly collapsed. Cities all around the eastern Mediterranean were sacked within a span of a few decades by assorted raiders. The Achaean kingdoms disappeared, and the Hittite empire was destroyed. Egypt repelled its attackers with only a major effort, and over the next century shrank to its territorial core, its central authority permanently weakened. Only Assyria escaped significant damage. The destruction at the end of the Bronze Age left a number of tiny kingdoms and City-states behind. A few Hittite centres remained in northern Syria, along with some Phoenician ports in Canaan that escaped destruction and developed into great commercial powers. In the 12th century BC most of the interior, as well as Babylonia, was overrun by Arameans, while the shoreline around today's Gaza Strip was settled by Philistines. In this period a number of technological innovations spread, most notably iron working and the Phoenician alphabet, developed by the Phoenicians or the Canaanites around the 16th century BC. During the 9th century BC the Assyrians began to reassert themselves against the incursions of the Aramaeans, and over the next few centuries developed into a powerful and well-organized empire. Their armies were among the first to employ cavalry, which took the place of chariots, and had a reputation for both prowess and brutality. At their height, the Assyrians dominated all of Syria-Palestine, Egypt, and Babylonia. However, the empire began to collapse toward the end of the 7th century BC, and was obliterated by an alliance between a resurgent New Kingdom of Babylonia and the Iranian Medes. The subsequent balance of power was short-lived, though. In the 550s BC the Persians revolted against the Medes and gained control of their empire, and over the next few decades annexed to it the realms of Lydia in Anatolia, Damascus, Babylonia, and Egypt, as well as consolidating their control over the Iranian plateau nearly as far as India. This vast kingdom was divided up into various satrapies and governed roughly according to the Assyrian model, but with a far lighter hand. Around this time Zoroastrianism became the predominant religion in Persia. From 492-449 BC the Persians made a series of unsuccessful attempts to conquer Greece. The civilization that had developed there since the end of the Bronze Age was organized along entirely different lines than those of the Middle East, consisting of numerous small City-States fielding citizen militias. Nonetheless they banded together and proved quite capable of dealing with the massive armies of their foe. By the fourth century BC Persia had fallen into decline. The campaigns of Xenophon illustrated how very vulnerable it had become to attack by an army organized along Greek lines, but the Greek city-states had weakened each other irreparably through in-fighting. However, in 338 BC the rising power of Macedon overcame Greece, and under Alexander the Great turned its attention eastward. Alexander conquered Persia in little more than a decade. Alexander did not live long enough to consolidate his realm, and in the half-century following his death (323 BC) it was carved up by his feuding generals. The Antigonids established themselves in Macedon, the Ptolemies in Egypt, and various small principalities appeared in northern Anatolia. The greater share of the east went to the descendants of Seleucus I Nicator. This period saw great innovations in mathematics, science, architecture, and the like, and Greeks founded cities throughout the east, some of which grew to be the world's first major metropolises. Their culture did not, however, reach very far into the countryside. The Seleucids adopted a pro-western stance that alienated both the powerful eastern satraps and the Greeks who had migrated to the east. During the 2nd century BC Greek culture lost ground there, and the empire began to break apart. The province of Bactria revolted, and Parthia was conquered by the semi-nomadic Parni. By 141 BC the Parthians had established themselves as an empire, after the Seleucid model, and had conquered all of Iran and Mesopotamia. The Seleucid kingdom continued to decline and its remaining provinces were annexed by the Roman Republic in 64 BC as Iudaea Province. The Parthian nobility reacted against growing Roman influences around the turn of the millennium. Throughout the next century there was a strong expansion of national culture and a dissolution in central authority. In AD 114 Trajan temporarily occupied Mesopotamia, and with the end of Hadrian's 40-year peace the two powers were at almost constant hostilities. Mesopotamia was occupied again, but the Parthians recovered and pillaged the Roman provinces. Shortly thereafter, though, the province of Persia rose up in revolt, and defeated the last Parthian emperor in AD 224. The new Persian dynasty, the Sassanids, restored central authority. In this period Zoroastrianism developed into an organised religion with close ties to the new state. Various sects of Christianity also spread throughout Iran, and Manichaeism developed from the two religions; these were initially tolerated but later persecuted as the Romans followed the opposite route. Conflicts with Rome, and later with the Byzantine Empire, continued intermittently. In 391, the Byzantine era began with the permanent division of the Roman Empire into East and Western halves. The last true Roman Emperor in the West was unseated in 476, by which time it had been completely overrun by Germanic nations; however, the Eastern half, known as the Byzantine Empire, lasted much longer, persevering in one form or another until 1453. Byzantine control over the sites of Israel and Judah and other parts of the Levant lasted until 636, when it was conquered by Arabs and became a part of the Caliphate. The Byzantines reached their lowest point under Phocas, with the Sassanids occupying the whole of the eastern Mediterranean. In 610, though, Heraclius took the throne of Constantinople and began a successful counter-attack, expelling the Persians and invading Media and Assyria. Unable to stop his advance, Khosrau II was assassinated and the Sassanid empire fell into anarchy. Weakened by their quarrels, neither empire was prepared to deal with the onslaught of the Arabs, newly unified under the banners of Islam and anxious to expand their faith. By 650 Arab forces had conquered all of Persia, Syria, and Egypt.